Treat unwanted scars and redness once and for all. Rosacea typically manifests as redness in facial skin, specifically around the nose, cheeks, forehead, and chin, but can also develop on the neck, chest, scalp, and ears. Untreated cases can develop into bumps, pimples, and swelling over time. 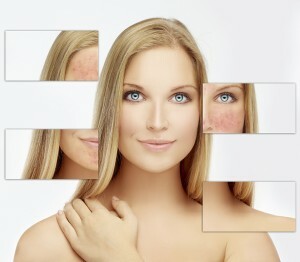 People experiencing this common skin condition frequently dismiss it as a propensity for flushed skin, unaware that it’s a long-term condition that develops gradually. Rosacea is unlikely to appear before the age of 30, and has been known to be a hereditary condition. Non-invasive Laser Genesis procedures at Ottawa’s Dermis Advanced Skin Care clinic can safely treat and diffuse redness and scarring , while avoiding the side effects of other treatments, such as irritation or bruising. Laser Genesis is a safe procedure, and users are comfortable and relaxed throughout as we gently treat and reduce the severity of rosacea. This thermo-cooling treatment is great for all skin types but is particularly recommended for dry, dehydrated, red, or sensitive skin. A light exfoliation followed by a seaweed-based rubberized mask helps to decongest the skin while providing instant relief to the skin’s barrier.